Ever since I declared I was a candidate for MP, I’m chuffed and grateful that party members from every single left-wing party, from the big mainstreams to the smaller minorities, have expressed support for my views and my values. I’m humbled that so many have got in contact from around the country, knowing me from my human rights campaigning, music and charity fundraising volunteering, to give me advice and offer words of encouragement. But I entirely understand their need to stick with their tribe, energetically campaigning and voting for their parties’ candidates. None of them has been out on the campaign trail with me and all of them have remained loyal to their parties, which I really respect. My non-alignment, a strong belief in inclusive, cross-party working on the issues that matter, has been my consistent strength for 25 years. My strong independence has been something I have employed in all my elected roles, from student welfare officer in 1992 to running the local Palestine human rights campaigning group between 2009 to 2014. It is even stronger now, despite being deafened by the cry for partisanship by the parties; I can still find individuals from all the parties who want to work together for the common good, not against each other. I have no worries about working cross-party in Parliament too. My focus is on you, Walthamstow’s constituents: on helping to craft social structures, systems and services that will make lives for all residents better; that are creatively ingenious, sophisticated and efficient but, by being publicly funded, cheaper for everyone to use; that embody humanitarian values, diversity, equality and social cohesion. I hope you will give me a chance to use my strength to be an independent MP in a hung parliament, to create a better future for Walthamstow through cross-party negotiations, getting the best deal for constituents at a national level. 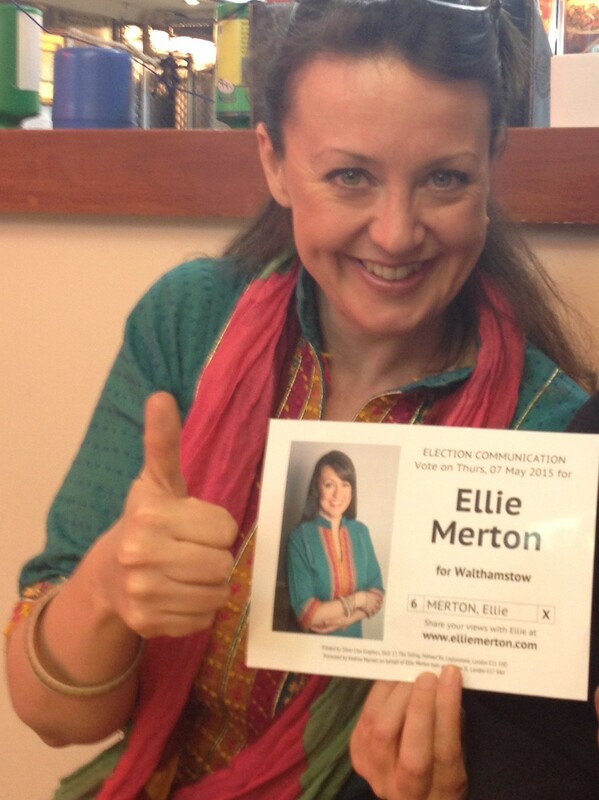 Vote for Ellie Merton for Walthamstow on Thursday 07 May! Polling stations open at 7am and close at 10pm. Enjoy voting! I’m being misrepresented in a number of ways at the moment, but I know voters have the wit and intelligence to spot the distortions. Seemingly, in some parts of the constituency, Royal Mail has delivered my independent election leaflet inside a political party’s booklet. As candidates, we got one free mailing through the Royal Mail. My 46,600 leaflets for Walthamstow constituency were duly delivered to a central sorting office but somehow, once they had gone into the Royal Mail system, my leaflet was collated inside someone else’s literature. However wrong that collating was, it has been happening to other candidates as well. The resultant misrepresentation is something election agents and candidates will be taking up with the Electoral Commission and Royal Mail after the election. On the web, however, the funniest misrepresentation is on Google’s Election Widget. It links me to Al Murray’s fictional party being used to promote his current comedy tour! So, so wrong on so many levels, and various organisations are looking into how that has occurred. In other misrepresentation news, I am flattered some candidates standing in Walthamstow now realise that my agenda from the outset of Health, Harmony and Human Rights suits the needs of our constituency. But I am not suddenly going to join one party, or another. I am, and will remain, an independent. My independence makes me stronger as an MP candidate for a hung parliament where every seat counts and I can work with MPs from different parties, but who share my core values, to get the best deal for Walthamstow. My independence means a lot to constituents. They tell me they have no faith in any of the parties. They tell me they want someone whom they can hold directly accountable, not hiding behind party policy. Before the hustings began, Dave Knight from WF Trades Council gave a moving dedication to Romanian worker, Marian Nemit, who died in a construction accident in Leyton recently (http://www.guardian-series.co.uk/news/wfnews/12909507.Picture_of_tragic_builder_released_as_reports_suggest_family_learned_of_death_on_social_media/). I want to express my condolences to Marian’s family and friends in Romania and the UK. There is a sizeable Romanian community in Walthamstow, many of whom I have spoken to during my campaigning. They are unable to vote in this particular election. They can vote in the local borough Council, London Assembly and EU elections, but not the Parliamentary elections. However, I have wanted to talk to them because the migrant worker population in Walthamstow is an important part of our local society and I want to spend time understanding their situation and needs. I want them to know, as well, I would care about their concerns as well as people voting for me. My experience is that the local Romanian community, along with the Bulgarian, Lithuanian, Moravian and other East European populations here, are incredibly hard working and contribute to the vibrancy and economy of Walthamstow. The reality is that migrant work is badly taken advantage of. East European and other migrants often get paid less than minimum wage, often on zero-hours contracts, endure appalling working conditions which defy any basic standards of health & safety, and face extraordinary levels of racial abuse. Frequently, they have to live in horrendous housing conditions and struggle to make ends meet, despite working all hours. I have met some of the homeless migrants in the area; gentle, thoughtful, hard-working. They are too proud to take handouts or rely on benefits. They simply want to make a living for themselves, and contribute, away from the corruption and oppression of their home countries. Waves of immigration going back over centuries have enriched the UK. We need migrants workers to succeed in their lives in the UK, to be able to contribute more to society, both economically and culturally. Migrant workers must be paid the London Living wage when working and living here, and their work conditions should more than meet basic HSE and employment law requirements. Otherwise, all that happens is that UK domestic workers’ pay and conditions are undermined, stopping them from contributing to the economy and forcing them to become reliant on the state for assistance. It benefits no one to mistreat or underpay migrants. 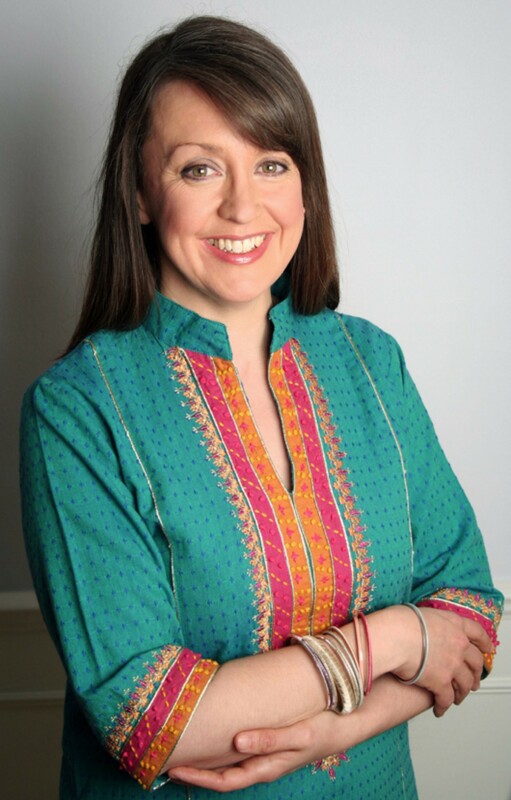 If elected, I would make supporting our local migrant populations a key focus of my work, and building social cohesion across Walthamstow to develop understanding and acceptance of each other’s cultures within the area. Today is Workers Memorial Day and I want to pay tribute to those who work tirelessly to improve working pay and conditions through trades unions and workers associations, particularly Waltham Forest Trades Council. As a woman in 2015, it should seem usual to be standing as a candidate in a general election, but it isn’t. Sadly, the political world is still dominated by men. Nationally, only a quarter of candidates standing are women. Full gender equality is a way off yet. I am proud to be one of four women standing for Walthamstow. As women, whether we like it or not, in seeking election we act as role models for the next generation of Walthamstow’s young women. We do not have to agree politically. In fact, our different views are a bonus because our range of political beliefs and experience demonstrates that, nowadays, there is no set path to achievement. Having said that, however, we can agree to respect each other’s lives and career choices as women. I respect all three other women candidates for the life choices you have made to date. You are great achievers in your family lives, careers and political aspirations. Walthamstow is lucky to have such a line up to choose from. See you there! If you cannot make any of the hustings, please do contact me and tell me your views direct, using the contact form on www.elliemerton.com or twitter or facebook! Yesterday in the sun, and the chilly breeze! Another cracking day of canvassing and learning. First up a roadside chat in the sun outside a local mosque, talking about faith, no faith, politics and Islam. I am constantly impressed by the depth of humanity, understanding and caring I experience when talking to anyone in our local Muslim community. We’re lucky to have such diversity in our borough. The highlight of the day had to be party time with local hero, Tommy Anderson, and the ladies and gentlemen of WF Social Club celebrating St George’s Day in fine style. 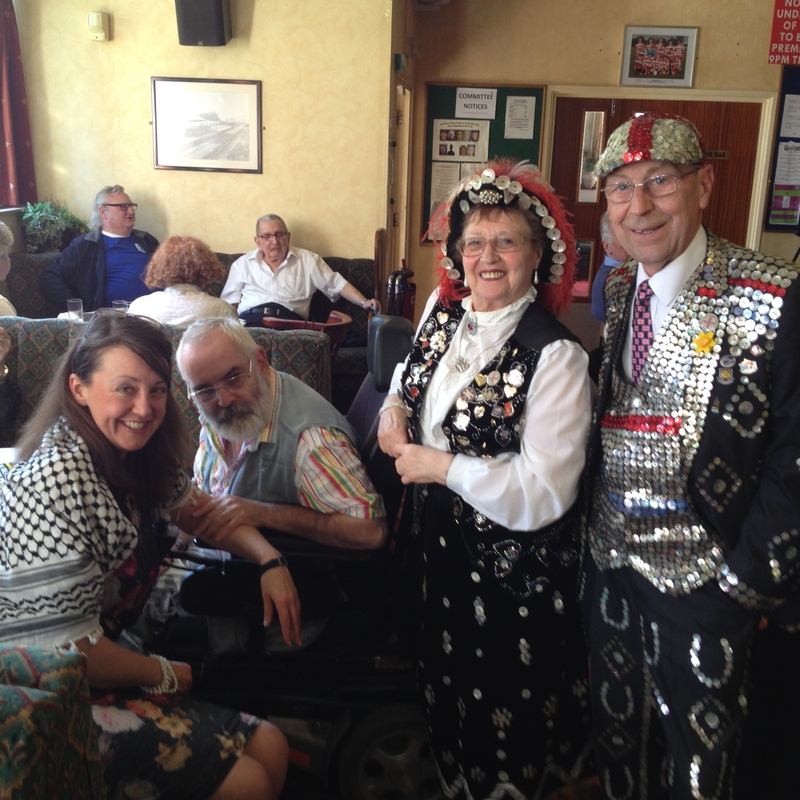 I was just a bit excited to meet a pearly king and queen and learn how they get selected and the types of charity work they do. It is staggering the number of projects they support and the time and effort they put in. And I learned the origin of ‘flash harry’. My plan had been just to pop in and say hello, but I was honoured to be firmly sat down at a table to have a hearty natter about life in Walthamstow during the war, how much the streets have now changed, housing difficulties, volunteering up at Whipps and social care provision locally. Francis (shown in the photo) and I had a top conversation about care allowances, how he’d worked for the same organisation since age 16, and his views on Whipps. A very special afternoon. Then it was off to a meeting on health, which confirmed all my personal suspicions about the way Whipps is managed and taught me a huge amount about how social and health care try to integrate, or not. General canvassing highlights included musicians, civil servants, lots of great women, my window cleaner on a bus the other side of town, a retired railway man who started his first job the same day as Bob Crowe, and a bit of late night Kebab Kampaigning. Join the campaign to Save Our NHS locally, focussing on Whipps Cross and local health services.